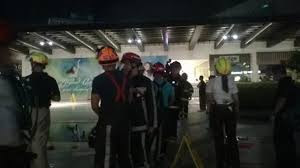 Breaking News: On June 15, 2015, roof of Ayala Center Cebu - Cinema 5 collapsed which injured 2 people. The incident happen Monday night and the news surfaced online. The collapsed of roof in Ayala Cebu was confirmed by authorities. It was not clear what cause the incident. The Ayala Center Cebu now investigating the said incident. Cinema 5 is located at the new extension of Ayala.